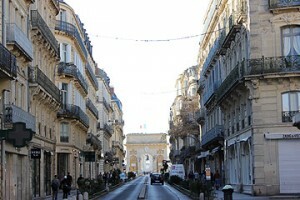 A recent visit to Montpellier has me wondering why I have never visited before and how soon I can return. It is a beautiful city made all the more attractive by its young and vibrant atmosphere – definitely one of our top 5 cities to visit in the South of France. 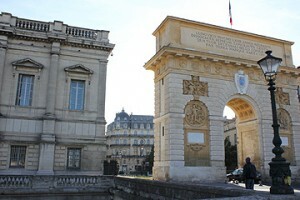 A visit to Montpellier starts on the Place de la Comedie, a huge square surrounded by fabulous 17th century buildings. It is sometimes referred to as the Place de l’Oeuf for its egg-shape. It is one of the biggest fully pedestrian squares in Europe. At one end the Place de la Comedie is dominated by its lovely Berlioz opera house (a 19th century addition) and at the other end it opens out to the long Esplanade Charles de Gaulle. This is another long open space bordered on one side by a public garden. An attractive statue-fountain sits in the square in front of the Opera House and around the edges are many pavement cafés allowing you to sit and people-watch and enjoy your beautiful surroundings. From the Place de la Comedie walk up the Pedestrian Rue de la Loge and into the charming historic centre of the town known as ‘l’Ecusson’. This area is filled with small squares, fabulous shops, some great bars and restaurants, art galleries and some of Montpellier’s very grand mansions including the Hotel des Tresoriers de la Bourse and Hotel Fizes. All in all there are nearly 80 of these grand mansions and the majority are classified. Heading eastwards the Rue Foch is dominated by Montpellier’s very own Arc de Triomphe. This was built at the end of the 17th century in honor of King Louis XIV. Next to the Arc de Triomphe is the impressive Neo-classical Palais de Justice and beyond is the Place Royale du Peyrou. Also in this area is one of the best preserved medieval Jewish baths in Europe. Visits to the Mikvé can be organized with the tourist office. The Place Royale de Peyrou is a huge open area lined by immaculately pruned plane trees and pleasant grassy edges. A popular spot with Montpellier’s students for a bit of revision ‘al fresco’. On the square is a water tower in the form of a Greek temple as well as a large statue of Louis XIV on horseback. With views of the Arc de Triomphe and also of Montpellier’s large aqueduct it is a great spot. There are also some excellent views from the Place Royale de Peyrou which stands higher than the surrounding countryside. You can even get a glimpse of the sea which is about 20km away. North-east of the Place Royale de Peyrou is the Gothic cathedral of Saint Pierre. It has a phenomenal entrance with a huge porch supported by two huge circular pillars topped with pointed roofs giving it the look of a medieval castle entrance. Next to the cathedral is the oldest running School of Medicine in the Western World. The medical school was started in 1220 with the forward thinking idea that anyone, regardless of religion or origins, could study there. Opposite the cathedral and Medical school is a large botanic garden. This too is the oldest in France and was started in 1593 to give the medical students a chance to study medicinal plants. It is a beautiful garden and is open to the public every afternoon except Mondays. Even in the winter the gardens have plenty of interesting plants to see. Antigone is a new addition to Montpellier. It was created after 1978 when the land was bought from the army. The area was designed by Ricardo Bofill and given a neo-classical look. There is a large square and a library and an Olympic size swimming pool as well as lots of hotel accommodation. This area can be reached by walking through the Polygone Shopping Centre. Montpellier not only has fantastic older buildings but it is using innovative modern architects to build some of its newer buildings. A new town hall has been built in the Port Marianne district to the east of Montpellier. This impressive blue-cubed building was designed by France’s premier architect Jean Nouvel who designed the wonderful Torre Agbar in Barcelona. He has also designed the RBC design centre which will also open in the Port Marianne district of Montpellier. Another great building due to open in the near future is the Pierre Vives building designed by Zaha Hahid. Zaha Hahid like Jean Nouvel is a winner of the coveted Pritzker Prize for Architecture. Montpellier’s tram system is also a must for style enthusiasts. The trams of lines 1 and 2 have been decorated by designers Garouste and Bonnetti and are covered in swallows (line 1) and flowers (line2). Lines 3 and 4 are to be decorated by Christian Lacroix. Line 3 will have an underwater theme and Line 4 will be bright and reflect the Languedoc sun. The Polygone Shopping Centre close to the Place de la Comedie contains many of the shops common to French cities such as Galeries Lafayette, Zara, Promod, Fnac and Habitat. For more unusual or exclusive boutiques head into the Ecusson area especially the streets near to Rue de la Loge and Rue Saint Guilhem. At the intersection of these two streets is a covered market hall selling a great range of fresh fruits and vegetables, meats and cheese. Montpellier’s new shopping centre at the Odysseum also has most high street favourites. L’Ecusson area is packed with a great range of wine bars, cafés and restaurants to suit all budgets from student to gastronomic treats. For a special treat the 2 Michelin starred Jardin des Sens . If you are looking for a tasty snack then head for the Bagel House on Rue Loys, for something unusual then Playfood on Boulevard Louis Blanc is worth a try. For more traditional fare then the Artichaut on Rue St Firmin or Le Captiva on Place St Roch are both good value. Montpellier has two opera houses. The Opera Comedie on Place de la Comedie and the Opera Berlioz in the Corum. The Opera Comedie is currently closed for renovations but the Opera Berlioz has a full programme. Montpellier also has a varied programme of theatre, dance and music. The Musee Fabre of Montpellier is considered to be one of the best Fine Arts museums in Europe and has works by the Grand Masters of France, Holland, Spain and Italy. Families with young or old children will want to check out the Odysseum complex which has been built in a style that is a mix of Space Odyssey and Ancient Greek! 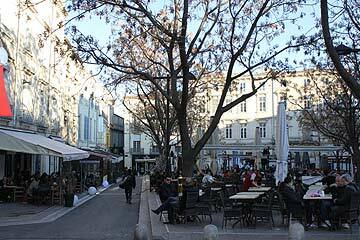 It is a great place for shopping and dining and is next to Montpellier’s Mare Nostrum Aquarium, Galileo Planetarium and Vegapolis Ice-Rink. It can be reached using tramline 1 and is situated east of the Antigone area. 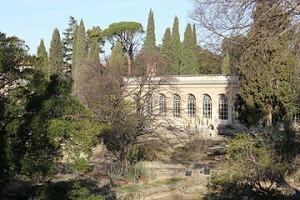 Montpellier also has one of the largest zoological parks in Europe, the Lunaret Park Zoologique. This not only has 90 different species of animals but it has a large Amazonian greenhouse. The park covers 80 hectares and is a favorite with the locals for taking a walk. The Lunaret zoo and Amazonian greenhouse are to the north of Montpellier on the road to Mende.